No need to panic as days are getting colder, at least here in Amsterdam. Norse Projects’ AW18 collection supplies a lot of goodies to get you through fall and winter. Norse Projects’ ongoing partnership with GORE-TEX brought us the perfect trans-seasonal jacket: their evergreen model Rokkvi has been updated with a GORE-TEX membrane and the firm promise to keep you dry. 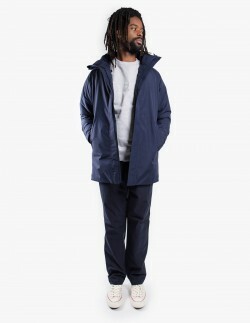 Norse Projects’ ‘Good for all seasons’ motto is dead on. On top of that, for men we got the Aros Corduroy pants. It’s surely not to much of a dare to say that corduroy is the material of the season. Unsurprisingly, because how could we ever do without this durable, velvety dream? Even if Norse Projects released their first women's collection in 2015 already, we are still extra excited to get the new pieces for this season. The girls’ winter coat is called Kristiane, it’s puffy, long and hooded for limitless cocooning. Plus water-repellent and lined with down certified by RDS to ensure animal welfare. It goes well, but not exclusively, with the Fylla Turtleneck Jumper in a gorgeous vibrant Ultra Marine. And when the crunch comes in January, Norse worked together with Swedish long-standing glove manufacturer Hestra that fights freezing fingers since 1936. For women, the Elba mitten is made of 100% Deerskin with a lambswool lining. The Utsjo model for men is made of Elkskin, super durable and comes in a vigorous yellow. Shop all women's and men's styles below.